Always on the prowl for innovative and cost saving appliances, we have started to import and distribute high quality Solar Generators and Homelighting Systems. Their main utility is cost saving, conserving environment and most importantly conserving public funds. 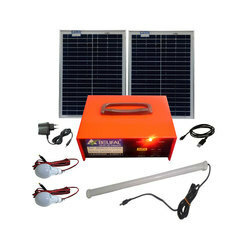 We offer our clientèle Solar Mini Power Generators They are manufactured precisely to the specifications forwarded to us by the clients. Manufactured in accordance with set industrial standards, these are known for their features such as superior strength, fine finish, durable performance. 40 watt silicon solar panel(cost extra) minimum required. With our universal converter, any make of mobile can be charged. also light equipment like all out personal hair dryer etc. can be run. DC fan also can be run on this. 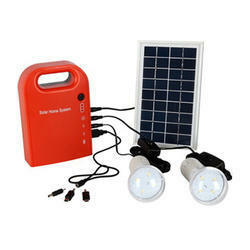 our solar fans, lanterns etc. can also be charged through it. We have due to our focus on quality of products, customization, process and service levels, our highly skilled service has been acclaimed for its minimal cost, as compared to competitive products that otherwise would have to be frequently replaced. Both ac /DC charging system. Can light up upto 20 of our DC 30 led bulbs for 8hrs.